A number of iPhone and iPad users have discovered cellular data usage is failing to work after updating to iOS 9. 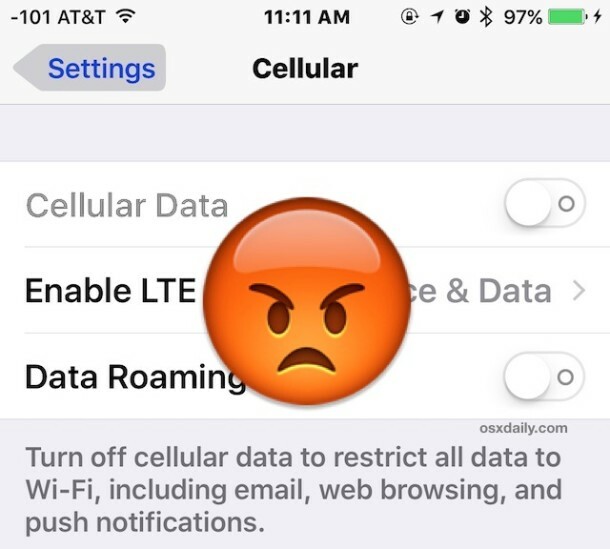 The cellular data problem is typically manifested in a few ways; either an outright failure to transmit any data or access the internet whatsoever when the iPhone or iPad is connected to a cellular network (though wi-fi continues to work), a failure of certain apps to connect to mobile data or access cellular data, or, in some situations the Cellular Data button is disabled but grayed out and unable to be toggled on. If you are experiencing cellular data transmission or mobile connection issues in iOS 9 or any of the iOS 9 point releases, you may be able to resolve the issue with some troubleshooting tips we’ll outline below. The first thing you should do is update to to the latest version of iOS. In fact, iOS 9.0.2 is specifically aimed at fixing this problem with cellular data. If you haven’t done that, do that first. Go to Settings > General > Software Update and when you see iOS 9.0.2 (or later) available, install that first. When the iPhone reboots to the latest version, the cellular data should work just fine. If not, continue on with the troubleshooting steps below. I know this sounds obnoxious, but double-check your general Cellular Data settings in iOS before anything else. For some users, they may discover cellular data was turned off, or that cellular data was turned off for specific apps. If you’re only able to connect to the internet with wi-fi and unable to access mobile data, this can often be the reason why. Obviously if the Cellular Data button is grayed out you’re not going to be able to do this, and if that’s the case, or if you tried this and mobile data is still failing in iOS 9, then continue on. When the device boots back up, try to use an app with cellular data again. It should be working at this point, but if not, read on. Cellular carrier providers will sometimes offer updates to the iPhone to increase compatibility with their network. You can check to see if a cellular carrier settings update is available by going to Settings > General > About, if you see a pop-up message offering to install a cellular carrier update, install it. Sometimes simply updating the system software will resolve the cellular data issue as caches and some basic iOS maintenance is performed behind the scenes during a software update. Be sure to update iOS 9 to the latest version available. If you’re on iOS 9, that means updating to iOS 9.0.1. A bit more risky, but you can also sign up to participate in the public beta program and jump to beta versions of iOS. Be warned though, beta software releases are notoriously buggy and tend to be less reliable. This is really only appropriate for more advanced users, but making a jump to iOS 9.1 beta may resolve the issue, assuming you can tolerate the beta experience. This can be a long process depending on the size of your iPhone or iPad and how much stuff is on there, so don’t start this if you don’t have potentially several hours to complete it. Annoying, I know. Nonetheless, resetting a device to factory default settings and then restoring it with a backup can often remedy peculiar situations. Absolutely backup first or you will lose data doing this. You can speed it up a bit by backing up and restoring from iTunes with a computer, which tends to be quicker than using iCloud backups, but use iCloud if that’s what you have available. Once the iPhone or iPad boots back up again, try to use cellular data. It really should be working at this point. In fact, the reset and restore process is often what Apple will instruct you to do if you call their tech support line with this issue, because it’s usually effective. If your cellular data is still not working after a complete restore, your options are becoming a bit more limited, and you may to try setting the device up as new (without restoring), or you may want to downgrade to a prior release while it’s still possible. An iPhone is obviously less useful without the ability to use the internet and transmit data over a cellular network, so if you find yourself unable to find a resolution with the above troubleshooting steps, you may want to consider downgrading iOS 9 back to iOS 8.4.1 as described here. It’s a somewhat technical process, but it is effective if you had no issues with the prior system software. Keep in mind that you will only be able to restore an iOS 8 backup to iOS 8.4.1, so you may lose personal data if you choose to go this route. On the plus side, leaving iOS 9 remedies any slow performance issues with iOS 9 if you have been experiencing those. Be sure to make a backup of your device before attempting to downgrade. Do you have a solution for failing cellular data access or the inability to use mobile data in iOS 9? Share it with us in the comments! iOS 9 is so problematic for some people, and trouble-free for others, what gives? Isn’t the point of the public beta program to test the releases are more real world situations and avoid these problems? Cellular data failure is a big problem on Apple iPhone Support discussion boards, and nobody has a clear answer except downgrading! At least Apple Support is aware of the problem(s) but that isn’t any less frustrating. What a headache. I guess I am glad the only problem I’ve had was a 3 hour install ordeal followed by the UI lag, which makes your iPhone 6 feel like an iPhone 3G with gunk on the screen. Honestly, I think the software glitches are somewhat deliberate on Apple’s part. Apple does this so people with older phones get frustrated (and thus will ideally upgrade to the latest phone). Those with the latest phones probably won’t experience these bugs. It’s a manipulative way of ensuring people continue to upgrade the hardware with the software. All tech companies do this to some extent…but with Apple this scenario is a little more obvious. Although I agree with your assessment for older phones, I already have the latest iPlus 6 and I still cannot connect via cellular data. My trust in Apple has been obliterated lately. Very frustrating. Yeah my trust in Apple has plummeted quite a bit, too. I’ve never used an Android phone but I’m willing to give it a shot at this point just to see if there’s less frustration (there’s probably less cost at least). Apple was great when they came right out of the gate with the first few generations of the iPhone, but now it feels like they’ve become just like the big lumbering ineffective tech companies they were once superior to. I wish Apple would just stop this stupid, nonsense rat race of having a new update every damn year. Instead, they should focus their efforts on decent thorough testing before releasing their buggy systems. iOS 7 still works flawlessly on each of my devices. There’s no way I’m going to screw them up by upgrading. Good luck to all brain washed people who think they life won’t be a fulfilled one unless constantly upgrading to the “latest”. I gotta say I agree. Had the wireless data signal drop down to EV-DO (which made me laugh) in an area I can almost always get 3-5 bars of LTE. I enabled and then disabled airplane mode and that did the trick for me. Haven’t seen it happen except that one time – but thought to post my experience with it. I have been a beta tester for iOS 9.1 for a few months and can tell you that it has problems with enabling cellular data usage for apps. If you have cellular data disabled for a particular app and try to enable it, the setting does not hold. Once you leave the setting screen, it goes back to disabled. This is the case whether you go to the individual app’s settings or to Settings > Cellular > use Cellular Data For. Disabling cellular data usage for an app works fine, but you can’t turn it back on. The latest beta 2 upgrade for iOS 9.1 does not fix the issue. Interesting note, that cellular data usage setting issue is only affecting my iPhone 6. I’m also testing with an iPhone 5C and it is working fine. This is my problem exactly, but it is only happening with my TouchTunes app. It all started after I did the upgrade. i am also having the problem with turning the data on for individual apps. what will I have to do to fix this problem? Will downgrading back to IOS 8.4 make me lose personal information such as pictures? if not how do i do this. I initially had the problem when installing iOS 9 to my iPhone 5s. Just bought the iPhone 6s today and same thing. What the hell apple!!! I tried every step in trying to restore the cellular toggle for certain apps including resetting and downloading beta 9.1. Same damn problem. Interesting that the new News App retains the cellular setting but Flipboard does not. Although neither does Apple Store. When will they get this fixed??? Set button as soon as you leave the screen it unsets itself. My 5s is two years old a 6s is not in my future. My 2 years is up. Why does Apple always make this so infuriating? It seems this problem always happen in the last few updates. Except this time for iOS 9.0, it just doesn’t seem to go away. I’ve tried everything except hard reset, if this doesn’t work I’m just taking it to Apple and complaining. I’ve tried calling Apple Support, and they are just so useless. Some try to help, and some are just so freaking dumb. If i have cellular data disabled for a particular app and try to enable it, the setting does not hold. Once i leave the setting screen, it goes back to disabled. This is the case whether you go to the individual app’s settings or to Settings > Cellular > use Cellular Data For. Your tips helped more than you know. There are a couple of apps that I rely on for emergencies, and after the iOS 9 update, they stopped working without WiFi. I thought that the 9.01 update, would help, but it didn’t. Following your tips, everything works as it should again, and I am grateful for that…this could have meant the difference between life and death in my case. I had the exact same problem when I upgraded to iOS 9.0.1. I was the phone with my cellular carrier and Apple for an hour and everything they told me didn’t work whatsoever. They said that if the problem wasn’t resloved by Monday, they would send me a new phone. ‘New’ as in refurbished. I was going to wait but reading your comments made me lose faith. Sorry Apple, It’s androids turn! No more to add than that confirm again, Mac Users are FREE BETA TESTERS….it’s again a LAME update, like all what Apple do since 2/3 years…. The “ios_support” twitter account is not Apple and has nothing to do with Apple, they routinely tweet falsities. I wouldn’t trust anything they tweet, it’s less reliable than a rumors site with good reporters. Of course Apple is aware of the issues, they harvest huge data on crash reports, forums, the web, and their tech support lines. After updating my 5S to OS9, my cellular data would not work for apps when away from a wifi network. I would switch cellular on for a particular app (at Setting>Cellular), leave the settings screen, and when I came back cellular data for that same app had mysteriously been switched off again. I called Apple Support and they said I had to “Erase All Content And Settings” at Settings>General>Reset. After that, I had to select a backup from one that had been done on a date BEFORE the OS9 update when it was running on OS8.4.1. If you use a backup that was done after the update then you’ll just bring back the same problem. Rob- did that erase any personal data ? I’m trying to select an old back up from my computer and it’s not letting me. It says I need to turn off Find My iPhone on iCloud settings and I can’t because cellular data for my settings are off and won’t turn on, so I can’t turn off Find My iPhone and can’t restore my phone using an old back up. I’m trying to select an old back up from my computer and it’s not letting me. It says I need to turn off Find My iPhone on iCloud settings and I can’t because cellular data for my settings are off and won’t turn on, so I can’t turn off Find My iPhone and can’t restore my phone using an old back up. Is there any way to select a back up on your phone? Just curious how many of you have Verizon Wireless? In response to Lisa’s question if the phone is verizon. No, it is carrier independent. The problem is if you had cellular off in 8.4.1 it remains off in 9.0.1. I had maps off in 8.4.1 and it remains off in 9.0.1. I had the App Store off in 8.4.1 it remains off in 9.0.1. Thank you! I have been trying for weeks to get this resolved. I updated to iOS 9.2 hoping that would do the trick, but still nothing. I was also going to do a total restore of my phone, but had the same problem as Maria mentioned above. This is the ONLY thing that has even remotely worked, and I’m finally back in the communication game. Thanks a lot, that worked for me too!!! To Jeroen, that setting does not exist. Please advise. I think they have forgotten to replace some lines which contains the word “cellular” in the new ios 9 software with “mobile” the word they started to use. This is a follow up to the post I made in 26 Sept.
Cellular data for my apps had been working for last 2 days. This morning, the problem has returned. I called Apple Support and they asked me to “reset network settings” and then “reset all settings” – neither worked. The Support Tech then spoke to his supervisor who said Apple are aware of the problem and they are working on a fix that will be included in the next software release – there is no reset that will provide a permanent fix – only a software update will resolve this. He said they will get 9.0.2 pushed out as soon as possible. I hope so! Indeed, have heard several reports that iOS 9.0.2 will be released to address the cellular data issues that have come to iOS 9 and iOS 9.0.1. Some users report no cellular data works, while others report excessive cellular data usage with iOS 9, appears to happen to both iPhone and iPad users. This is what iOS 9.0.2 will address, apparently. Apologies if this has already been mentioned, but it appears that any apps for which cellular data was enabled at the time of the OS upgrade, still work and the cellular data “on” setting persists. However, if an app was disabled for cellular data at the time of the upgrade, the enabling of cellular data will not persist. On my iPhone 6plus, I had the Waze traffic app enabled for cellular data at the time of the upgrade; now it is the ONLY app for which the cellular data “on” setting persists. I had this issue and I was able to fix it. First, backing up my contacts on lookout app then restoring my phone as new using iTunes. I restore my contacts by using lookout and not iCloud or iTunes as I was still having the same issue restoring from previous backup using those two. Nonetheless, I restore my phone as new using iTunes, download contacts from lookout backup before restore, and reinstalled previous apps. This seem to resolve the issue. It appears the upgrade is causing a freeze in restoring backup once you upgrade. After update IOS 9.01 fail to enable Application under cellular mode. Therefore please advice how to solve this kind of problem as soon as possible. I am no happy facing this kind of problem. urgently please assist for this problem . Thank you ! Now I should be change To Android phone , after update IOS so many problem under 4G service all my applications are fail to work! What going on such as Email , free txt & call . I only can say that this Apple products are too expensive but useless . Conclusion we can not say that it is good & best smart phone compares to others brand. I just bought my iPhone 6 about 2-3 months ago right before they announced their 6s because my iPhone 4 finally gave out and since the new update like the latest one, I have no more iOS update options, I’m having major problems with it connecting to cellar and also wifi so really all I have is an iPhone that sends text messages not even iMessages and will make phone calls, I can’t use any apps, I can only listen to half my music when I’ve downloaded every song into the actual phone… I’ve done all these steps and it still has the same problem, Im sorry but for a $600 phone it works like complete crap and I have never been more annoyed or disappointed by an apple product in my life and as someone who needs their phone for school and work it’s even more frustrating to have an unrelaiable phone that wasn’t cheap, I have to say if they don’t fix their crap soon, I’ll be taking this phone back even if I don’t get my money back and buying a Windows phone. Apple is not the same anymore- instead of making reliable devices that last and work to their best, they’re just racing to have the newest phone out there, even if they only work half as good as they’re suppose to which is bullsoot for the prices we pay. I tried everything but the only one that worked was deleting my iphone. Yes, delete everything and when it starts up, don’t back up anything. Instead, before you erase ur iphone, transfer every important files to your computer or ipad, etc. and then just transfer it all back after you erase your iphone. Create a new icloud account when u start up ur phone and then data will work in every apps again..
couldn’t get cellular, went to Verizon they couldn’t fix, kept doing soft resets and turning off and on. NOW just get a loop asking for password, language, country and repeat over and over. Can make emergency call, maybe, but absolutely nothing else. I know part of the problem might be that I have too many pictures but recently it wouldn’t let me delete any, and out of storage. any suggestions or is this thing dead!? thanks if so! Since I upgraded two iPhones (5s and 4s), I am having issues with roaming data transfers charged despite roaming data in turned off – issues continues after the 9.0.1 update. I have had to restore the two iPhones within iTunes and with no backup restoring to fix the issue. Thank you for your suggestions here. I’ve spent several hours today reading, looking for help for the cellular data issue. When I looked at #3 again re software update, I saw that Apple just released 9.02. Sure hope this works. Downloading as I type. 9.02 just released…claims to fix problem. But of course requires wifi connection to download….has anyone tried it yet? I am running iOS 9.0.2 and it appears to work fine with the cellular data, it has fixed that bug. Thank you for posting that 9.0.2 was out. I was having the same issues as above, which brought me here, and now it seems to be fixed since installing it. I’m running 9.0.1 on a iPhone 5. Cellular data works on some apps (like Facebook) but in others it turns it off for that app even after I’ve manually changed the setting. There are also some delays when unlocking the device and between apps. Makes me sad :( I really loved my iPhone 3 before it was pushed out of existence. I experienced the no cellular data after downloading the IOS 9.0.1 so I called T-Mobile and they told me to get help from Apple. The lady from Apple told me to factory reset my iPhone 5 by first back up everything to iTunes (what a mistake! ), it took more than 5 hours and nowhere near finish. I decided to stop the iTunes and back up everything to my computer (which took less than 30 min.) and reset . The problem still persisted so I decided to give T-Mobile another try. A T-Mobile tech man in Colorado Spring tried step by step different process and came with the solution! it works, but you only get 4G speed. Thank you! My mom has had this issue with her iphone 5C for more than a year. I just fixed it with your solution. Thanks for your solution! Rock on! Similar problem with my wife’s phone Vzn provider. Phone was working fine with the 9.0.1 ios for 5 days. Suddenly Oct 1 at about 1100 am it stopped working for cell data. Phone would only work in 3G mode and would not use any data unless connected to WiFi. Contacted apple; they had me reset network settings, turn off cell data, put phone into airplane mode and turn off phone. On restart everything turned itself back on. The next step they gave was to restore phone to factory and they will call me back on the 2nd. After I did the restore the phone now will not connect to my wireless carrier at all. Looks like I will be banging on the Apple store door at opening to get them to fix or replace the phone. I too have been without cellular data since iOS 9. I have updated to the latest and same issue. Full factory restore without restoring from backups and same issue. Did a recovery restore and same issue. I’m a registered developer and installed 9.1 beta 3 and still no cellular data. I’ve exhausted all options and now hate my iPhone 6. I’ve lost all faith in Apple iPhones at this point. Just ordered an unlocked Nexus 6 and will go back to Android where I never had any issues (so far). If Apple will allow us to go back to 8.4.1 then I would stay with my iPhone but they have stopped allowing that. I am 9.0.2 and still can’t get access to apps while on cellular data which means my personal hotspot won’t work either. The tec at Apple was no help. There is a software update now that fixes this issue. I have been on Metro PCS with my iPhone 5 for a few years. Everything was fine. After upgrading to ios 9.0.2 my cellular data doesn’t work. Cellular Data Network doesn’t show on this ios anymore and after talking to a metro pcs agent, it seems that they don’t even know that. They can’t help. Since they don’t have a solution in hand, they just say that iPhone is not supported by Metro PCS. Apple doesn’t allow to jump back to the previous ios, so now we are all stuck with a phone that doesn’t connect to the internet. Anybody found a workaround? Thanks. 1. Updated iTunes on my computer to the latest version. 2. Tried to go back to 9.0.1 but it didn’t work. iTunes said my iPhone was not eliglible for that. 3. Reinstalled 9.0.2 just to see what would happen. 4. Selected to restore from a backup I did in June. It took a while but now it works. Good luck everyone. My device is iphone 6s plus 128gb. Just updated it to 9.1 from 9.0.2 and now i am unable to connect to Airtel 3G in india. tried resetting the network settings. Erased iphone and restored from itunes backup. I also updated my iPhone 6 to 9.1 yesterday only. I am seeing lot of network issues. It remains No Service most of the times. Mine is also Airtel 22.1 now. Wow your iPhone vowels keys aren’t working? Wow that’s amazing. Did you reset network settings? That would be the first thing to do. That should make your iPhone vowels work. I don’t know about how you would use Android on an iPhone I think you may be wrong there. When are we going to get iOS 9.2????? to fix this $h!t ?? I solved the problem enabling LTE and disabling roaming data. Many days in trouble after update 9.02 on iPhone 5S. I turned off the LTE on ios 9.0.1 and it worked. Thank you! The reset network has fixed it I think! My issue was it wouldn’t recognise cellular data for iMessage kept saying it wasn’t on and to use wifi. After resetting network it seems all good! I have an iphone 5s i have done everything. – no service 9.1 and was on 9.2 and it still did not function. -This is bs. i dont understand apple why waste my time and money anymore. Maybe you forgot to pay your bill. Call your cell phone provider, some cut off service without notification to you. Probably has nothing to do with iPhone, it’s maybe your cell network. i am also facing the same issue since morning, unable to connect any social app whereas the LTE & 3G is connected and network is full. Not obnoxious at all. I would have started there if General > Cellular Data existed. It does not nor does Personal Hotspot. So much for ease-of-use Apple. I miss Jobs. Thank you so much! Because of this website my internet data connection is resolved . At first it went to 3G when I have LTE and did not change and I didn’t know what to do . With 3G I could text or surf the web . Thanks again to you my data internet is fixed! I meant in the last comment with 3G I could not do any web surfing and texting. I’ve had the same issue since I got my iPhone 6s, 2G works fine but 3G doesn’t work, it overheats the phone and shows no network most of the time. I’ve restored my phone to factory settings before and it didn’t help. Any suggestions? Your iPad 4 is connected to wi-fi, that is what you should do if cellular data is not working. Take it to your cellular store and ask them to fix it. They are the experts, the cellular experts at your store you bought iPad from. The cellular data requires the mobile carrier. this apple product is a big problem for me my ipad did not support and shown on my device how can i get or install the data cellular on my ipad? I’ve been trying to fix this problem for awhile now (at least a year) I’ve probably tried everything and all the websites say the same things. It’s so frustrating because I literally can’t do anything on my phone unless I’m st my house or at a place with free wifi. I need a new phone. Screw apple. Reset network settings and all is working. Thank you so much!!! Resetting my network settings worked like a wonder to me. Thanks a lot. I had the same problem. The Apple Store Genius worked out that the bug is in the Restore. You have to Reset and start from new again. Dont Restore because you bring back the bug that prevents you getting Data. The icloud contains Profiles that are nasty.